Sitting may be the new smoking, but standing is not necessarily the cure. Dr. Naomi Abrams, president of Worksite Health and Safety Consultants of Rockville, Maryland, points out that standing for long periods of time has its own health issues. Sitting for long stretches during the day has been linked to an increased risk of obesity, as well as cardiovascular disease and cancer. However, working in a standing position for a long period of time can bring swelling of the legs, sore feet, and general muscle fatigue. Trying to combat sedentary work by using a standing desk can lead to other problems as well, Abrams points out. A unit that is not attached to the desk could pose a safety hazard if it tips. Abrams sees movement as the antidote to too much sitting. Rather than simply spending money on new furniture and redesigned spaces, companies should incorporate more movement into their culture. Solutions can include incorporating some standing into the workday, and encouragement from leaders for walking meetings. Saying, “Let’s stand – I’ve been sitting all day” provides an opportunity to reinforce a culture of movement. “That’s a cultural change that has to happen,” said Abrams, who urges people to take every opportunity to move during the workday. When a person’s hands aren’t on the keyboard, that person could be standing, she notes. While standing desks aren’t a cure-all for an inactive workplace, they do have a place, she notes. Desks that can be easily raised and lowered are preferred, she said, as most people are not fit enough to stand and work for long periods of time. Ergonomics issues often crop up because office furniture is not adjusted properly. A computer may be in an awkward position on a desk simply because of where it is plugged in. A person with back pain may ask for a new chair, but may not know how to adjust their current chair, keyboard, or monitor. 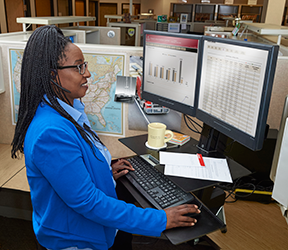 While it’s important for employers provide information on workstation adjustments, it’s also key for them to be on the lookout for a link between ergonomics issues and employee health. An employee’s musculoskeletal issues and medical bills could be related to office ergonomics. “I’m finding that employers are just waiting too long,” she said. “They’re waiting for employees to complain. A health risk analysis that gathers aggregate data is an excellent tool for prioritizing wellness issues, including ergonomics-related concerns, she notes.